We reached our $20,000 goal thanks to our generous donors! THANK YOU FOR MAKING OUR DREAMS COME TRUE FOR THE ZOO’S BROWN BEARS AND THEIR HABITAT! We are excited to announce that BP has agreed to match up to $20,000 in private donations to upgrade our brown bear habitat in 2018 and we recently reached this funding goal! Donations made to the zoo’s general fund on behalf of the brown bears were matched dollar for dollar by BP. Supporters who donated maximized their dollar impact through this amazing opportunity. Together, we are breathing new life into the brown bear habitat for our resident bears whose long life spans and energetic behavior require the best we can offer them. We will all take pride in this new habitat when it is completed in the spring (after the bears wake from their winter’s sleep!). We thank you again for your support of the Alaska Zoo and of the animals who call the zoo home. As we approach our 50th anniversary in 2019, we are excited to have the funds in place. * Any funds donated over and above cost of the project will be directed to the general fund for the care and feeding of all animals. Brown Bear habitat under construction before it opened in 1983 to house Jake and his late sister Jackie. When the Alaska Zoo opened this habitat back in 1983, it was designed for two bears, Jake and his sister Jackie. Jake, a Kodiak brown bear, still resides here and is the zoo’s oldest resident at 36 years of age. Oreo is an orphan who arrived from Mt. Susitna, Alaska in 1998. Izzy came in 2010 as an orphan from King Cove, Alaska. It was not the zoo’s intention to house Izzy permanently, however it became necessary when funding plans at his receiving facility fell through. This placed our brown bear habitat over capacity. If you have visited the zoo recently, you have likely noticed how hard the bears have been on their home. Their natural behaviors have killed the trees along with all new plant growth. The age of the habitat and worn appearance generates negative feelings for visitors who prefer to see variety for the bears. The indoor area also needs upgrades to the zookeeper space and mechanical room. The bears are already seeing the fruits of your donations! Image by zookeeper Tim Lescher. Two 12-foot by 12-foot platforms which will provide shade and climbing. A large boulder pile for climbing and exploring while searching for treats. A wobbly tree enrichment structure which will consist of a stiff but flexible pole with a basket on top which can be filled with treats and toys. This encourages stretching, pushing, standing and problem solving. A mechanical room remodel to include a prep area, a new water heater, utility sink and counter top work space. New toys! Boomer Balls are toys made for bears, tigers and large animals living in zoos. They are indestructible with holes and grooves where treats and scents can be placed for sensory stimulation and problem solving. Aerial view of the completed Little Campbell Creek restoration area with the new moose habitat fence in place. Image by John Gomes, www.akjohn.com. We plan to relocate the moose to their new habitat in 2019. We completed their new area but needed to allow a season of vegetative growth before introducing the moose. We will update everyone as we move toward that final goal in 2019! 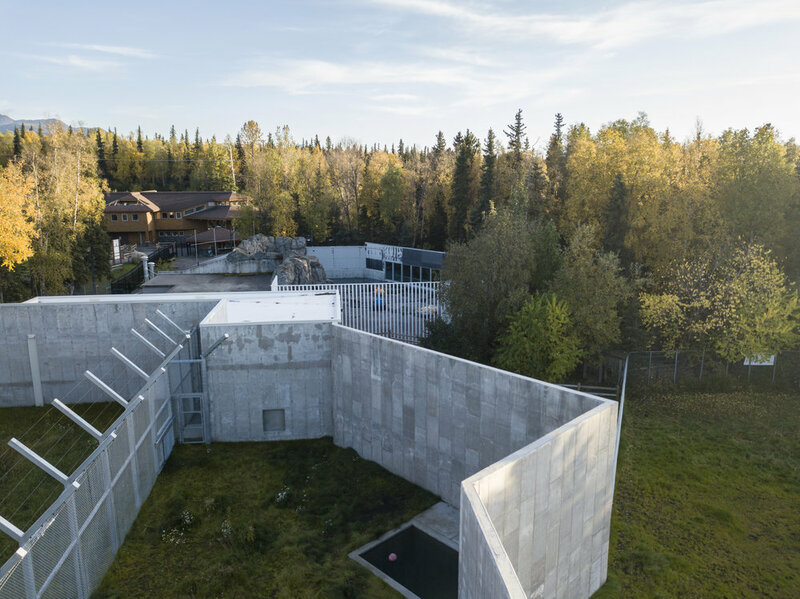 Aerial view of the completed Phase I of the Polar Bear Habitat, with the Transition Facility including maternity dens and an off-exhibit area for bear holding. Grass to the right side of the image is the old moose habitat which will become the expanded muskox habitat. Aerial photo by John Gomes, www.akjohn.com. The zoo has a history of working with wildlife agencies, zoological facilities, universities and organizations to further the scientific knowledge and behavioral study of our animals. We are collaborating with the U.S. Geological Survey, U.S. Fish and Wildlife Service, Alaska Clean Seas, Cincinnati and Memphis Zoos and the University of Alaska Anchorage on polar bear research. Phase II will be the more "public side" of the project. This phase was planned to follow in quick succession after the completion of Phase I, however the economic climate of our state and funding challenges are sending us back to the drawing board in terms of a strategy and timeline. We must re-examine previous cost estimates and potentially revise our plans to make a realistic and successful approach moving forward. We will keep our supporters and donors updated as we develop these plans for Phase II.